போதிய மழை இருந்து நிலத்தடி நீர் நிரம்பினாலும் கூட தாது மணல் சுரங்கம் எதுவும் இல்லாத பகுதிகளிலும் நிலத்தடி நீர் உபயோகிக்க தகுதி அற்றது. அதே நேரத்தில் தாது மணல் சுரங்க பகுதிகளில் நிலத்தடி நீர் எந்த பாதிப்பும் இல்லை. இந்த செய்தி தாது மணலுக்கும், வைகுண்டராஜன் மற்றும் விவி மினரல் நிறுவனத்திற்கும் எதிராக உள்ள பொய் பிரச்சாரத்தை வெளிச்சத்திற்கு கொண்டு வரவில்லையா!!! 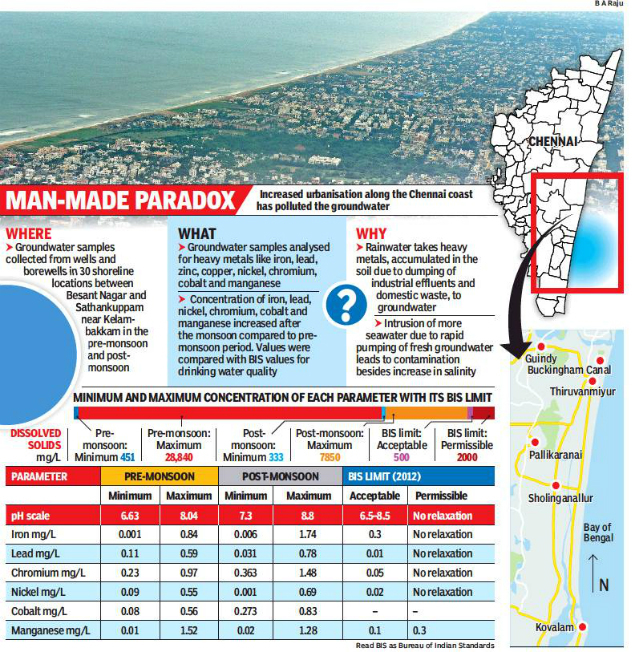 CHENNAI: The northeast monsoon might replenish the city’s aquifers and bring relief to the residents till summer, but the rain seems to do little to improve the quality of groundwater. 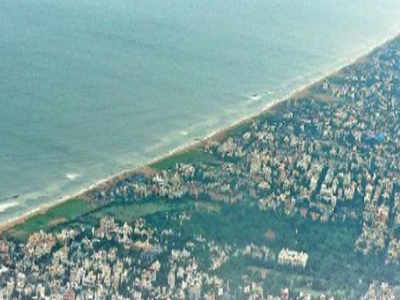 A joint study by researchers from University of Madras and Anna University shows that after the monsoon, concentration of heavy metals like lead, iron, chromium, nickel, cobalt and manganese increases beyond acceptable limits in the water table in localities between Besant Nagar in Chennai and Sathankuppam in Kancheepuram district. Researchers compared groundwater samples collected before and after monsoon with Bureau of Indian Standards (BIS) drinking water values and inferred that the contamination of groundwater was due to the dumping of industrial effluents and domestic waste which seep into the aquifers along with rainwater. According to BIS, if the quantity of any metal in water is beyond the acceptable limit, the water is rendered unfit for consumption. “The groundwater is contaminated due to rapid urbanisation which results in increase in industrial effluents and dumping of domestic waste,” the study said, adding that the effluent discharge accumulates heavy metals in the soil initially and later moves to the aquifers when the rainwater percolates. The study, published in Springer’s journal Applied Water Science in September 2017, was conducted in an area of 270sqkm along the Bay of Bengal and covered Thiruvanmiyur, Pallikaranai marshland, Sholinganallur, Kovalam and localities close to Buckingham Canal and Muttukadu backwater. wells and borewells, and studied the presence of eight metals. The levels of six metals were high. “The study area has been rapidly urbanised over the past few decades. This has deteriorated the condition of the aquifers,” the study said. Experts said toxic elements present in dumped waste were capable of seeping into the groundwater depending on permeability of the soil. In areas like Pallikaranai, dumping of waste causes leachate (liquid that drains from a landfill) to penetrate surface water and later into the groundwater. “It is similar to how water in the percolation pit or recharge well slowly takes it to the groundwater and then recharges wells. The quality of groundwater depends on the quality of the surface run off,” said J Saravanan, consultant hydro-geologist, Rain Centre. The study found that concentration of iron in the groundwater could be due to corrosion and leaching from pipes while lead concentration could be due to plumbing material like pipes that react to the alkaline water. Chromium comes from dumping of municipal waste, nickel from sewage and corrosion of nickel alloy material, cobalt due to leaching from solid waste and manganese from solid waste and automobile emission. Doctors said consumption of water contaminated with such elements can cause several health problems. Lead could damage kidneys and cause hypertension, nickel could lead to loss of weight, damage the heart and liver, and manganese could cause permanent neurological disorders. Senior surgical gastroenterologist Dr S M Chandramohan said absorption of lead into the body could lead to acute abdominal pain called plumbism. “Usually when patients come with chronic abdominal pain, we will rule out other conditions before we conduct tests for lead content in the blood,” he said. This entry was posted in Blog, Media News and tagged #mining, beach mineral, beach mining, Dhayadevadas, Garnet, illegal mining, Ilmenite, Mining Baron, Mining Scam, monazite, rare earth, Sandhya Ravishan, thorium, vaikundarajan, Victor Rajamanikkam, VV mineral. Bookmark the permalink.